Bored with zoos and want to experience some real wildness? 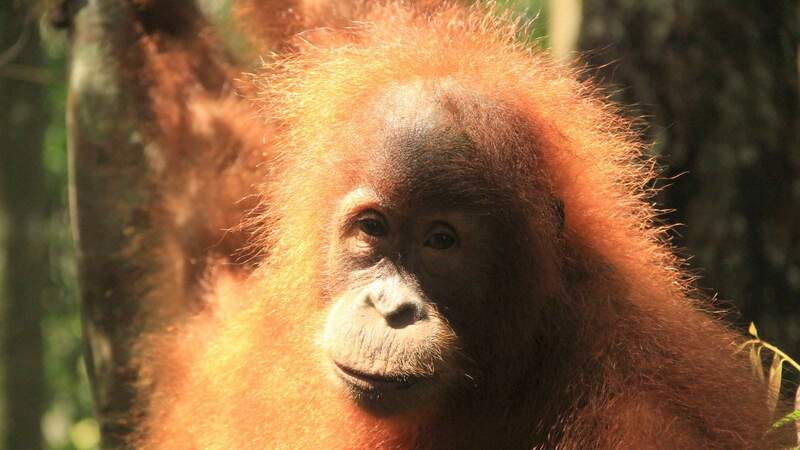 Go on a trek in Gunung Leuser Park on Sumatra for a fantastic opportunity to observe wild orangutans (and other interesting animals) in the rain forest. 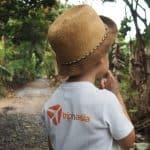 How accessible is it from Singapore? The total door to door journey is about 6 hours 50 minutes from (your home/office in) Singapore to your room in Bukit Lawang, starting point of the trek. This includes a 1h30 flight to Medan and a 3 and a half hour drive to Bukit Lawang. The best way to arrange your transport from the airport is to book it in advance directly with your trekking guide (see details in “getting there”). Overall, this trip is relatively cheap and good value for money. Of course, as you spend one night in the jungle, you save on your housing. In total the trip will cost you around SGD 800. Transport from Singapore will cost you about SGD 565 return for 2. This estimate includes the flights (SGD 220 return per person) and car (SGD 125, IDR 1,200,000 for 6 pax return). Of course, if you are traveling with friends or family, you can share the cost of the car. If you travel on your own, you will likely have to pay the full car on your own (but ask your guide if you can group with other people). Accommodation and activity wise… A room at the guesthouse before the trek will cost you about SGD 20 (IDR 120,000 per room) and the trek will cost you SGD 100 per person. So, in total, you will spend about SGD 220 for 2 pax. How remote and risky is it? It’s relatively difficult, especially as you stay one night in a camp in the jungle. Physically it’s not extremely difficult but you will need to walk in the jungle and the paths are very rough and you will need to use your hands to hold onto trees etc as you go up or down some pretty steep hills. The guides will adapt the itinerary to your fitness level. However, heat, mud, mosquitoes, leeches will be your partners during the trip. Don’t expect great comfort (although the camping structure and logistics are perfectly managed by the guides). Tubing can be rough depending on the current and has limited safety (life jacket but not helmet). The jungle is full of lovely animals and insects. Some of them carry interesting diseases. So far none of us suffers from anything but you might want to check all your vaccination, allergies and take your medicine with you. Expect a very bumpy and slow ride on the road from Medan airport to Bukit Lawang towards the end of the journey. Definitely not for babies, toddlers or young children! The trek is too difficult and the tubing is too dangerous for young children or babies. You could potentially take teenagers for a Tarzan or Mowgli weekend (make sure you let the guides know so that they adapt the itinerary and tubing accordingly). The best period to visit Gunung Leuser Park and avoid the rain season are the months of January, February, March, April, May, June and July. Refer to the chart in the sidebar for details about the monthly average rain volumes and rainy days..
Now, these are the dry season months so this means you may not be able to do tubing and that the “rain forest” may look very dry. It’s also the busy season for tourists which means you may see more people and less animals during your trek. When checking with our guide Thomas he was saying the best season was probably around October November. Gunung Leuser can be a standalone destination from Singapore. If you have more time, you can extend your trip and go visit Lake Toba but be ready for a long journey to get there. Return ticket from SGD 220. Caution: Medan’s new Kuala Namu International Airport opened on 25 July 2013, replacing Polonia Airport (MES), which closed the same day. Money changers, restaurants, shops & ATM are available at the airport. The new airport is like a mall with many shops. However there is no McDonalds or Burger King there. Public bus – cheaper & longer. You’ll first have to get to the Pinang Baris Bus Station. Taxi fees from the airport to the bus station: IDR 50,000. Ask for the bus to Bukit Lawang (Gotong Royong is the bus stop to Bukit Lawang). The journey takes approximately 4h30 and will cost you IDR 15,000 / pax. Then from the bus terminal in Gotong Royong to Bukit Lawang you can get a becak (motorbike, IDR 10,000). You might meet jungle guides offering their service on the bus, although we recommend you book a guide in advance. Where to stay in Bukit Lawang? You will reach Bukit Lawang quite late and you will spend the first night in the village, on the bank of the Bahorok River. There are a few guesthouses in Bukit Lawang, if you have not booked a guide yet the guesthouses can arrange one for you. The package with Thomas Jungle Tours includes a night at his own guesthouse, for IDR 125,000 per room (about SGD 15). You can get an extra bed if you want to have 3 people staying in the same room. His guesthouse also has a restaurant area with food and drinks. Rooms are clean and good value for the price. 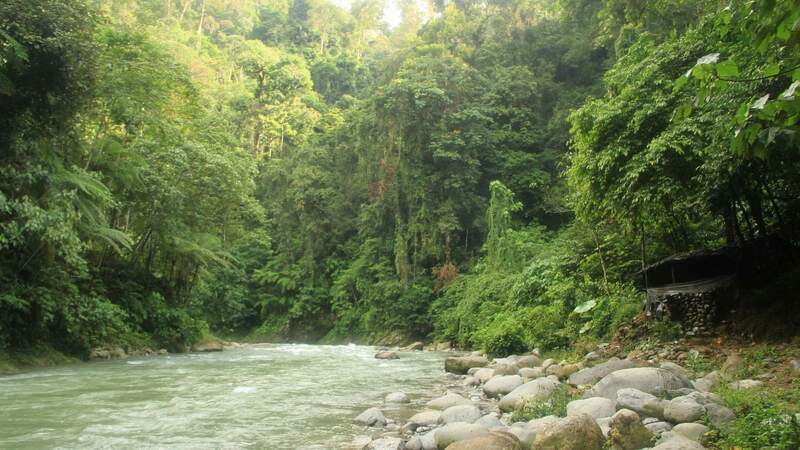 However, if you are looking for something more charming, you may want to check for alternatives in Bukit Lawang. Chances are you will get there late and start early the next morning so you will not spend a lot of time at the guesthouse. You will be able to leave some of the stuff you do not want to take with you on the trek (convenient if you get there straight from the office and if you want to save some clean clothes for your way back). You will also be able to take a shower after the tubing activity on your way back. 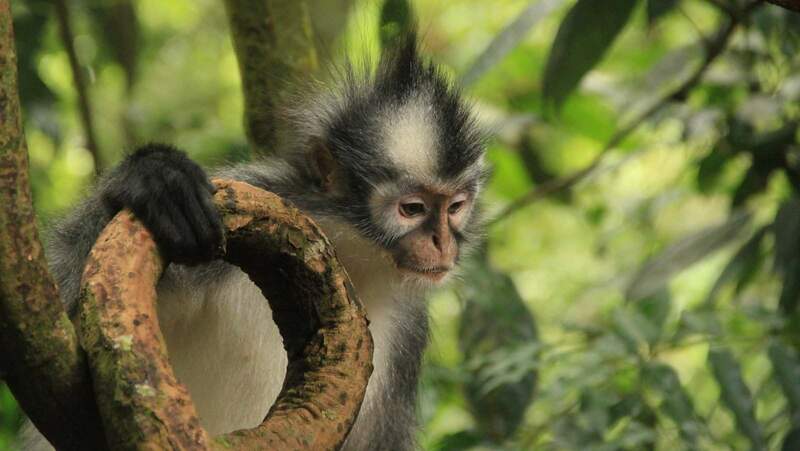 The must-do activity is of course the trek in the jungle where you’ll have opportunities to observe the wildlife and, if you are lucky enough, several species of monkeys and apes, including the famous Sumatran orangutans. The trek itself is not very difficult if you are in good physical condition (talk to your guide before if you are not fit enough, they can arrange a different itinerary suitable for your condition). The length of the trek varies depending on the option you choose. Assuming you only have 2 days there, you will walk for about 7 hours on the first day, and for zero to one hour on the second day (depending on which camp you use and the water level), to reach the starting point of the tubing activity. If you do the trek over a period of 2 days or more, you will spend the night in the jungle in a night camp. Not far from there, there is a small waterfall which is great to cool down after a long trekking day. You will literally sleep under a tarp on thin ground sheets, but the whole thing is waterproof so you don’t have to worry about getting wet if it’s raining during the night. There will probably be a few other tourists at the camp. The guides will cook very good Indonesian food, chat with you and propose some entertaining games when the night comes. The Gunung Leuser National Park is blessed with the Bahorok River, which can have quite fast currents, so it’s not appropriate for swimming. However you can do tubing down the river, which is the best and funniest way to go back to the Bukit Lawang village. Your guide will pack and secure your stuff in waterproof bags, and the journey will last about 20 to 30 minutes. If you prefer, you can also ask to arrange a return by paddle boat. The price for a weekend trip – trek and night in the jungle + tubing – costs SGD 100 per person with “Thomas Jungle Tours”. Thomas is the owner of the agency and the main guide. 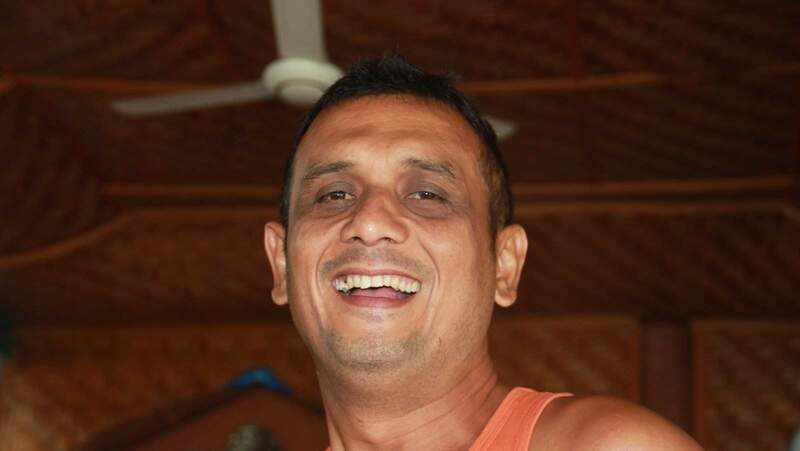 He also works with other guides, speaking good English and respectful of the nature. Contact details: www.thomasjungletours.com (note that Thomas does not have control over this website and that the information may not be updated) – jungleman_thomas@yahoo.com – (+62) 81376 330753. Thomas’s English is excellent when he speaks however his emails may be a bit confusing. Give him a call if you need to clarify some points. When selecting your guide, ask how many people will be in the group and make sure you will be not transferred to another guide in a larger group. You can either take longer trek (up to 2 weeks if you want!) or spend some time in the area. Wander around to see the rice and rubber plantations. You can also visit the bat cave (IDR 5,000, make sure you have a torch light) or simply walk around Bukit Lawang and get a coffee or a beer at one of the guesthouses. Internet access is available at most guesthouses in Bukit Lawang (sometimes for a fee). Potentially a sleeping mat. Not a must as a thin one will be provided. Thomas provides blankets and pillows in the jungle!). You may also want to add a sleeping bag if you are worried about the temperature at night (most people should be OK but the temperature is not high at night). A swimming suit for a dip in the river and the tubing back to Bukit Lawang. If you are going to trek, chances are you will have to carry all your stuff all the way. So you want to be pick all you need but just what you need. Every gram in your bag is a extra weight on your back. Short sleeves tops: your main outfit. Everybody will see them on all your pictures. You really want to take that old Mickey Mouse T-shirt? Long sleeves tops: to protect yourself from the sun or to enter religious buildings or to protect yourself from mosquitoes in the evening. Pullover. Temperatures can be freezing when you climb up volcanoes or mountains. Above 2000 meters, even in the hottest countries, it is usually cold. Trousers for the same reasons you need to take long sleeves tops. Jeans are usually not a good option. They are heavy and keep you too warm. They are also not comfortable to walk. Trekking pants are best. Shoes: take a pair of flip flap on top of your of (good) trekking shoes. Remember that you are going to spend most of the time on your feet. If your shoes are new, make sure you use them before you go for your trek. Cover for your bag. Even if you are visiting the country during the “best season”, you never know what the sky will be like. Torch / lamp: head or pocket lamp with you. It comes handy when walking by night or in a tent. Toilet bag: Shampoo, soap, toothbrush & toothpath, deodorant, sun screen, tiger balm, wet tissues, . Ideally, all these in miniature formats. Warm sleeping pants, jumper and socks if you plan to camp in altitude. Your IT stuff: iPad, eBook, laptop, memory card, batteries, etc. Check if you will have power on the way to size the battery you need. Your passport, cash, credit cards and other life saving items like your insurance card with emergency contact details. Your driver licence if you plan to rent a car or a motorbike (some countries are quite particular about this so take it with you in case you are not sure, even for a motorbike rental). Trekking poles if you are going for a serious trek. If you don’t have some, ask the guide or porter if they can make some for you out of wood or bamboo. You will probably adjust the content of you bag after a few trips. Remove the stuff that you have not used and add the one that you missed. Post a comment to share your tips! Happy packing (it’s the worse part of the trip but it’s worth it…) and travelling! After Romain a couple of years ago it was my turn to go explore Gunung Leuser Park and meet Orang Outans around Bukit Lawang. Great experience. Relatively cheap and easy to arrange from Singapore for a 2 day weekend. Great experience guaranteed. I used the opportunity to update the article. Have fun!